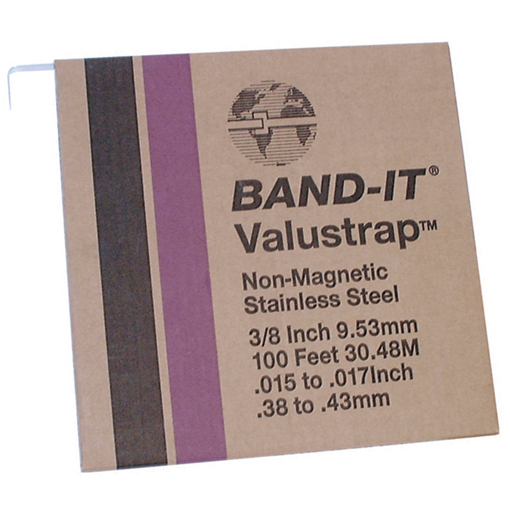 The BAND-IT VALUSTRAP Band & Buckles range is manufactured from a non-magnetic 200-300 AA grade stainless steel strapping used in lightweight fastening applications such as securing signs, pipe insulation and bundling cables – VALUSTRAP banding systems have good resistance to corrosive elements. VALUSTRAP Austenitic Stainless Steel – Available in mill coil lengths, all in standard cardboard packaging. The VALUSTRAP range of stainless steel banding manufactured by BAND-IT, is available in a range of material widths and breaking strains to suit all cable, pipe or hose bundling and fastening applications.